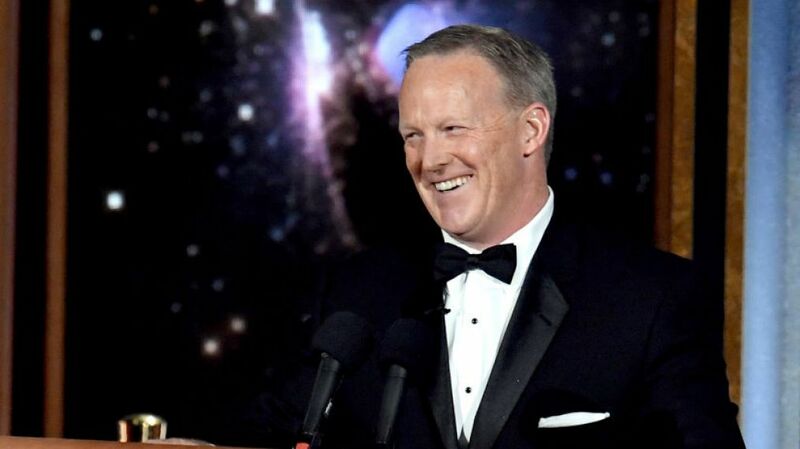 Former White House Press Secretary Sean Spicer speaks onstage during the 69th Annual Primetime Emmy Awards at Microsoft Theater on September 17, 2017 in Los Angeles, California. Stephen Colbert kicked off the 69th Primetime Emmy Awards on Sunday, Sept. 17, with a song and dance number including bedazzled dancing Handmaids and Anthony Anderson from ABC's Blackish. But what left the crowd with their jaws on the floor was Colbert's stab at Real Time with Bill Maher host, Bill Maher, for using the N-word on his show earlier this year. And then, without warning, former White House Press Secretary Sean Spicer, appeared onstage pushing a podium to mock himself and President Donald Trump. Stars hit the red carpet of the 69th Primetime Emmy Awards accessorizing their glamorous gowns and tuxedos with a special blue ribbon. Here's why. "This will be the largest audience to witness an Emmys, period. Both in person and around the world," Spicer said. The joke was meant to make light of Trump's interpretation of the crowd size at his own inauguration in January. Of course, the camera panned to Melissa McCarthy, who portrayed Spicer on Saturday Night Live and won an Emmy for her guest role on the sketch comedy show. Celebrities hit the red carpet of the 69th Primetime Emmy Awards on Sunday, September 17, 2017. Who will be the best dressed? Who will be the worst dressed?